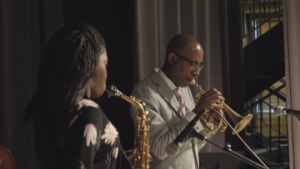 By Dominic Garcia, Denver CBS News | Metropolitan State University of Denver Professor Ron Miles absolutely loves jazz. He says when he plays music, he tries to be as present as possible. “I also think about the people who came before us who are looking down, if they decided to take a break from what they’re doing, they’d enjoy what they’re hearing,” he told CBS4’s Dominic Garcia. Miles recently released the jazz album “I AM A MAN.” He says the album was inspired by Martin Luther King Jr. and what he did before he was killed. “It celebrates 50 years since Dr. King went down to Memphis to initially support the sanitation workers, but was tragically killed at that same time… the placards that the striking workers were holding symbolizing we are people, and I am man,” said Miles. He hopes when people listen to his music, they think of the message Martin Luther King Jr. preached. You can watch the 61st Annual GRAMMY Awards on Feb. 10 on CBS4. Garcia Dominic Garcia anchors CBS4 News at 5 p.m. and reports for CBS4 News at 10 p.m.